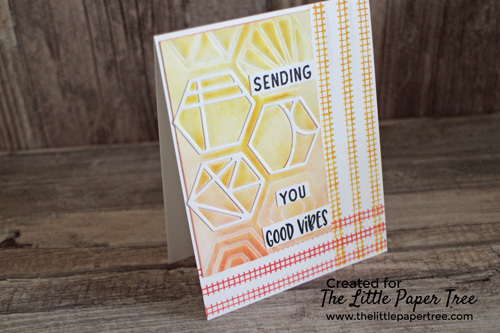 It’s Janet’s time again to showcase a CAS card I made with the new Stamp of Approval Collection. Stamp Of Approval is a quarterly collection of specially selected craft goodies. This Tropically Yours collection has 5 clear photopolymer stamp sets, 1 red rubber background stamp and 1 die set. When I saw the Cabana Tiles dies I knew that I would try and dry emboss with them amongst other cards I have created with this die, as I love it, and it’s so versatile. On a panel of A2 Neenah Solar White, I placed the dies on my die cutting machine (after first making sure I had made the machine ready for embossing) and ran this through so the dies would press into the panel, without cutting. I also ran the dies through with another piece of Neenah to cut the pieces out of the dies. Then using the Spa collection of inks (Shea Butter and Manderin Spice) I very lightly blended the inks over the embossed panel using my blending brush. Around the edges of the card I used my blending brush to lightly colour the edges. I cut this panel down to 7cm x 11cm and adhered three of the actual die cut pieces to the coloured panel over the corresponding areas. On a small strip of card stock I stamped the sentiment ‘Sending you Good Vibes’ with midnight ink, cutting this into smaller, single words to fit my card front. On a top folding card base I used the same coloured inks and the Good Vibes Borders stamps set to create a border along the right- hand side of the card and the bottom of the card. Ensuring that the top of the card is masked off, so the ink is only showing on the front of the panel. After all stamping was dry I adhered the small panel to the left -hand side of the card base. TIP: You can also run through your envelope flap using the die to co-ordinate with your card. Have you seen the newest member of The Little Paper Tree? Milly is settling in nicely and has really bonded to both myself and Jeni.